The XXI World Congress Local Organising committee is pleased to launch the event logo and website. The committee has been hard at work on the programme and marketing material and sponsorship packages. The programme coordinator on the Local Organising Committee is enlisting the assistance of a team of academic colleagues at South African university law faculties to serve as a reference team in developing and refining the scientific programme. In addition, senior colleagues in key centres are being approached to serve as contact persons and coordinate input from colleagues in their regions. 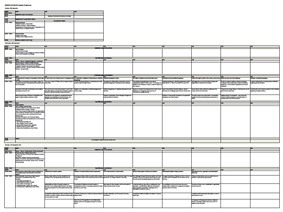 The basis for the programme is the draft that was approved by the International Executive Committee in Santiago in 2012, with its four themes being (a) Collective bargaining – and beyond? (b) Equality and industrial citizenship as conceptual foundations for labour law (c) Towards sustainable social security in an insecure world, and (d) Labour law in the developing world (South Africa in comparative perspective). The final theme is intended to encourage maximum participation from South Africa itself. The LOC will liaise with the officers of the IS in further developing the programme and plan to submit a final draft to the IEC in September 2014. 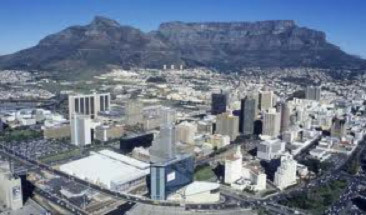 As one of the top ten tourist destinations in the world, Cape Town is no ordinary city. So it stands to reason that the CTICC would be no ordinary convention centre. And the fact that, in just nine short years, it has become widely regarded as one of the leading convention centres in the southern hemisphere bears testimony to this fact. Posted in Cape Town 2015, ISLSSL Events, Meetings & Events on February 19, 2014 .
necessary to ensure a successful conference and sets time lines for the achievement of defined objectives. Signature of the agreement has cleared the way for the establishment of an entity through which the Congress will be managed, the opening of bank accounts, and the appointment of specialist contractors, e.g. 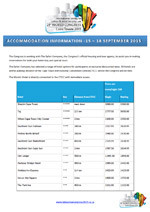 transport, accommodation and tours. The Conference Company CC has undertaken responsibility for the administration, material and logistical preparation of the event, the management and registration of participants, etc. Sub-committees of the LOC, each chaired by a SASLAW representative, have been established to manage the various components of the Congress and its organisation. The academic and content committee is chaired by Prof Darcy du Toit, the marketing and sponsorship committee by Adv Anton Myburgh SC, the procurement and operations committee by Mr Richard Maddern, the finance committee by Adv Tanya Venter, a Cape Town liaison committee by Ms Gillian Lumb, and a national conference integration committee by Prof Peter le Roux. We have also appointed an administrator, Ms Clare Fincham. The venue has been secured in terms of a contract between the Conference Company and the ICC, after a final inspection and decision on accommodation requirements by Profs Darcy du Toit and Marylyn Christianson. 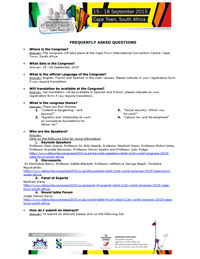 Immediate tasks are the finalisation of the Congress website and the logo; the website will ‘go live’ by end October 2013. The programme coordinator on the LOC (Prof du Toit) is enlisting the assistance of a team of academic colleagues at university law faculties to serve as a reference team in developing and refining the scientific programme. In addition, senior colleagues in key centres are being approached to serve as contact persons and coordinate input from colleagues in their regions. The basis for the programme is the draft that was approved by the International Executive Committee in Santiago in 2012, with its four themes being (a) Collective bargaining – and beyond? (b) Equality and industrial citizenship as conceptual foundations for labour law (c) Towards sustainable social security in an insecure world, and (d) Labour law in the developing world (South Africa in a comparative perspective). The final theme is intended to encourage maximum participation from South Africa itself. the IEC in September 2014. Posted in Cape Town 2015, ISLSSL Events, Meetings & Events on September 29, 2013 . 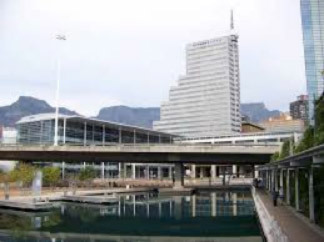 The Congress will take place at the state-of-the-art Cape Town International Convention Centre. It is a sign of this venue’s popularity that, when we made inquiries late last year, only one week remained in September 2015 during which the Congress could be accommodated. 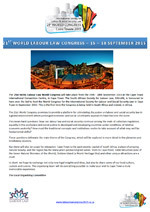 Although the LOC realised that many of our members prefer the informality (and relatively low cost) of holding the event on university premises, we also discovered that ILERA (the former IIRA) is also holding its World Congress in Cape Town in September 2015, and had already taken steps to hold it on the campus of the University of Cape Town during the vacation week that month (more about this later). 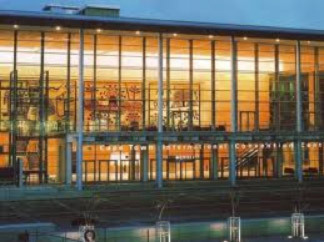 Given that there are few conference venues large enough to host up to 1000 delegates comfortably, the LOC decided to take the plunge and make the reservation at CTICC. 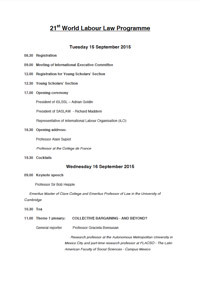 The dates are therefore confirmed for the 15 to 18 September 2015. 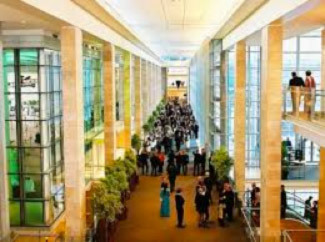 A unique feature of the event will be the integration of the SASLAW Annual Congress with the World Congress, with a view to attracting the maximum number of South (and Southern) African delegates (this accounts for the large number of delegates we are preparing to accommodate). In essence, it will involve including a number of sessions with topics likely to appeal to local as well as international delegates as one of the Congress themes. A network of South African labour and social security law academics is being built up to assist the LOC as a ‘think tank’ in designing a programme which will address cutting-edge issues and, we believe, will attract lively interest from practitioners as well as researchers internationally. That brings us back to the ILERA Congress which (as in Sydney in 2009) may well take place back-to-back with the ISLSSL Congress. While some would see this as ’competition’, we prefer to see it as an opportunity. Discussion has already begun with our colleagues on the ILERA organising committee with a view to harmonising our programmes in such a way as to encourage the maximum number of delegates attend both events. Also, from a scientific point of view, in-depth analysis by leading scholars of similar or related issues from different disciplinary perspectives could lead to an exciting advance of knowledge. 2011 and the world’s second-best city by Condé Nast Traveller in 2012 (the best was Charleston, USA in case you’re wondering). Cape Town is located next to one of the world’s seven natural wonders (Table Mountain) and two UNESCO world heritage sites (Robben Island and the Cape Floral Region), we are sure its many attractions will encourage maximum attendance. Building on the traditions of many excellent world congresses held in beautiful and historic cities in past years, we believe that the XXI World Congress will be an experience that will long be remembered. Posted in Cape Town 2015, ISLSSL Events, Meetings & Events on March 11, 2013 .